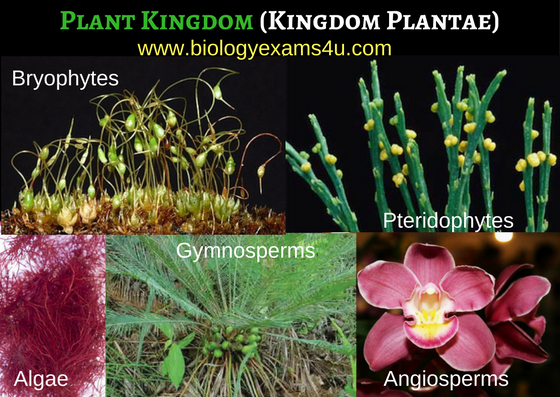 The plant kingdom comprises multi cellular photosynthetic organisms. They constitute the predominant producers of the biosphere. They include both aquatic and terrestrial plants. The aquatic plants include both fresh water and marine; they are green, red and brown algae. Land plants are grouped into bryophytes and tracheophytes. Bryophytes are non vascular plants. They are comprised moss and liverworts which live only in moist places. Examples: Riccia, Marchantia, Anthoceros, Funaria. Tracheophytes include all the plants with vascular system. Body of these plants are distinguished into stem, leaves and roots. Tracheophytes are grouped into Pteridiophytes, Gymnosperms and Angiosperms. Pteridiophytes are producing neither flowers nor seeds. Gymnosperms and angiosperms are seed bearing plants. Gymnospems seeds are without fruits (naked seeds). Eg: Cycas, Pinus, Deodar etc. Angiosperms produce covered seeds i.e., within the fruit or seed are covered by the ovary. Habit and Habitat: Immobile and photosynthesising plants. Some flowerings have evolved a heterotrophic mode of life. Nutrition: Nutrition is autotrophic. Plants prepare the food materials from water, carbon dioxide and inorganic essential elements using light energy trapped by chlorophyll and accessory pigments. Structure: Plants are immobile. The plant cells are covered by a rigid cell wall formed of cellulose. So cells are not capable of contraction and relation. The plant body is formed of tissues; organs like structures and vascular tissues are present in higher forms. Reproduction:It occurs by asexual and sexual or both.